Currently, they have an EP which was released December 20th, out on iTunes, and their album My Head is an Animal has been released in some countries, but not the UK. It’s scheduled to come out in the UK later this year, but all the songs are on YouTube to listen to now. They are an Icelandic band, which has enjoyed fame in their home country after winning Músíktilraunir, a nation-wide battle of the bands in Iceland, and their single Little Talks has started to catch on in the UK and US indie scene. The title of their album My Head is an Animal gives an accurate first impression of what they’re about. A bit absurd, a bit thought provoking, but mostly just about having a good time. Don’t go looking for deep meaning in their lyrics. Although some of their songs (like Love, Love, Love) deal with, well, love, the majority of their lyrics are nonsensical. That doesn’t mean they’re not enjoyable and fun to sing along to. 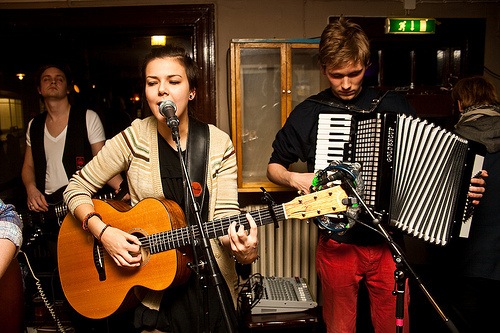 The lyrics in Of Monsters and Men’s songs are based on myth and fairytales, and the ones that make sense are about crazy creatures and adventures through strange worlds. The band says that they get a lot of their inspiration by taking newspaper stories or fables and putting themselves into those stories. This mythical quality is supplemented by the beautiful voice of one of the two main singers. Nanna Bryndís Hilmarsdóttir sings with Ragnar Þórhallsson; she has a strong, clear sound that really complements Ragnar’s smooth, male voice. Whilst having two lead singers may seem odd, it works well in this case. It’s not like they’re competing for the spotlight, but is as though they are having a conversation; an element that works with their story-telling songs. The music has a definite folk feel, with frequent accordion music and trumpets added to guitar and drums. It’s also infectiously catchy and a real musical treat. Images sourced from The Music Ninja and Meet the Monster. This entry was posted in The Bon Vivant and tagged Gig, Iceland, Japanese, Little Talks, Lyrics, Owl Eyes, Snowdrops in Moonlight. Bookmark the permalink.